Rice wine, also known as mijiu, is an alcoholic drink made from rice, traditionally consumed in East Asia, Southeast Asia, and South Asia. Unlike European wine, which is made by fermentation of naturally occurring sugars in sweet grapes and other fruit, rice wine is made from the fermentation of rice starch that has been converted to sugars. The process is somewhat similar to the mashing process used in beer and whiskey production but differs in the source of the enzymes that convert starch to sugars. In rice and other cereal wines, microbes are the source of the enzymes whereas beer, ale and whiskey production utilizes the enzymes naturally occurring in sprouted barley. Strictly speaking, wine is the product of fermenting grape juice. 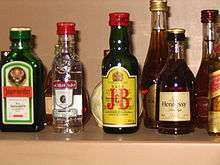 Alcoholic beverages produced by fermenting the starch found in cereal grains like rice are thus not technically wine as such. As they utilize grains, so-called starch or cereal wines such as Japanese sake or Chinese huangjiu could be considered more akin to beer than wine, yet the finished alcoholic beverage is so disparate from beer that this description is very misleading. The organoleptic qualities of a fermented cereal beverage such as rice wine are much more like grape wine and this is often the context used for its description. Rice wine typically has a higher alcohol content, 18%–25% ABV, than grape wine (9%–16%), which in turn has a higher alcohol content than beer (usually 4%–6%). Rice wines are used in Asian gastronomy much the same way as grape wines are used in European cuisine, e.g. at formal dinners and banquets and in cooking. Secondly, rice wines are used in a religious and ceremonial context in a manner that grape wine was used in ancient Greek and Roman civilizations and is still used in the modern Christian eucharist ceremony. Rice wines are also revered in the arts and literature of Asian cultures much the same way grape wine is in European culture. Beer is rarely used in any of the former contexts, so in the eyes of many rice wine is the correct cultural translation for the fermented cereal beverages of Asia. Rice wine is much used in Chinese cuisine and in other Asian cuisines. A common substitute for it is pale dry sherry. Apong - An Indian rice wine indigenous to the Mising tribe, from the Northeastern states of Assam and Arunachal Pradesh. Ang Jiu - Chinese red rice wine, popular among the Fujian Chinese (Malaysia, China). The red color is derived from iron in the red yeast rice, the traditional yeast culture made from wild yeast in the city of Fuzhou, where this style of rice wine originated, and the ancestral origin of many overseas Chinese in the Pacific islands. Hariya -A white/watery rice wine from India. Huangjiu - A Chinese fermented rice wine, literally "yellow wine" or "yellow liquor", with colors varying from clear to brown or brownish red. 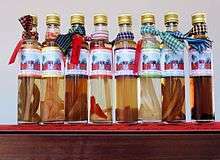 Ju Mai - An Indian local rice alcohol indigenous to the Boro tribe of the Northeastern State of Assam. Luk Lao - rice wine of the Tai Ahoms of Assam. Which can be preserved for years. It attains red color when aged (around 6 months). Makgeolli - a milky traditional rice wine indigenous to Korea. Mijiu - a clear, sweet Chinese rice wine/liqueur made from fermented glutinous rice. Mirin - a Japanese rice wine used in cooking. Pangasi - Rice wine from Mindanao in the Philippines. Rohi - A sweet, white type of rice alcohol, commonly made by the Sonowal Kachari tribe belonging to the Northeastern Indian state of Assam. Mostly consumed during festivities and family gatherings. Sake - A rice wine from Japan. 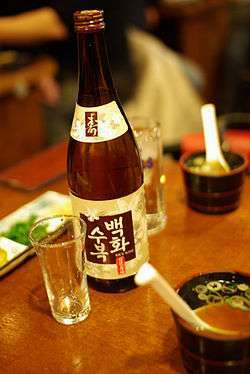 The most widely known type of rice wine in North America because of its ubiquitous appearance in Japanese restaurants. Thi- Kayan rice wine,served in a clay-pot with a straw to sip (Kayah State, Myanmar). Xaaz - A Indian local white rice alcohol from the Northeastern state of Assam, predominantly in the rural households of the districts of Upper Assam. Consumed mostly during the harvesting and New Year festival of Bihu in the months of January and April respectively. ↑ Huang, H. T. "Science and civilization in China. Volume 6. Biology and biological technology. Part V: fermentations and food science." (2000). ↑ "Rice wine recipes", BBC, accessed 31 March 2011.